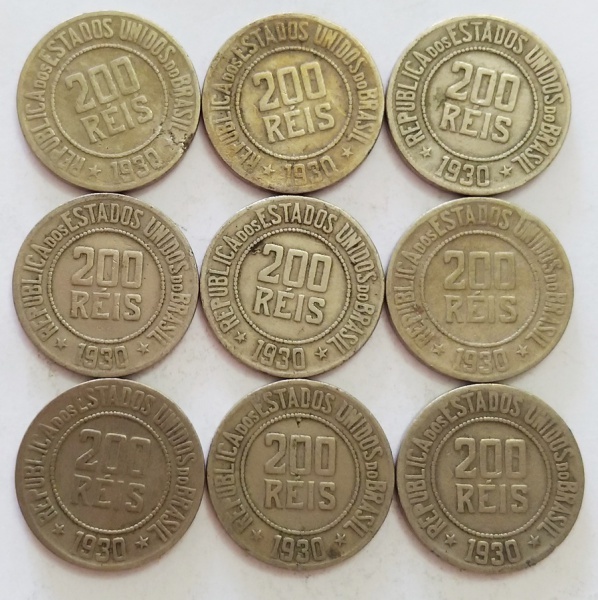 BRASIL - 9 MOEDAS DE 200 RÉIS CUNI ANO 1922 CIRCULADAS. 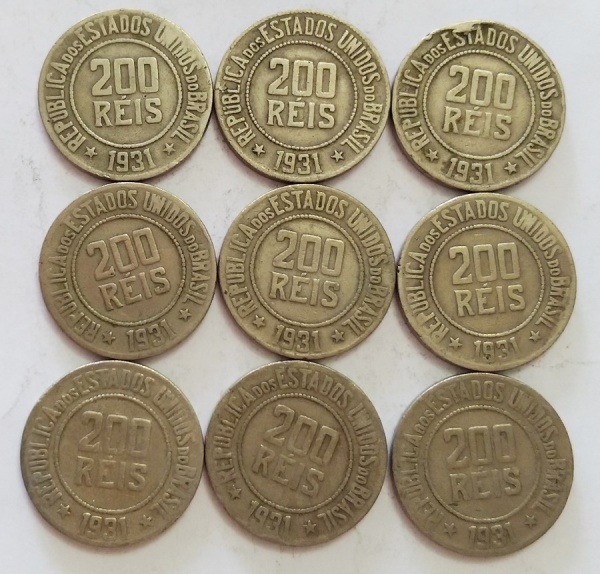 BRASIL - 9 MOEDAS DE 200 RÉIS CUNI ANO 1925 CIRCULADAS. 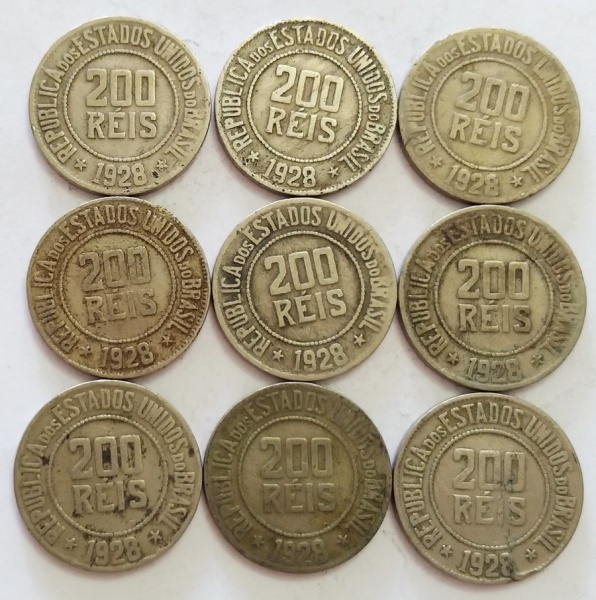 BRASIL - 9 MOEDAS DE 200 RÉIS CUNI ANO 1928 CIRCULADAS. 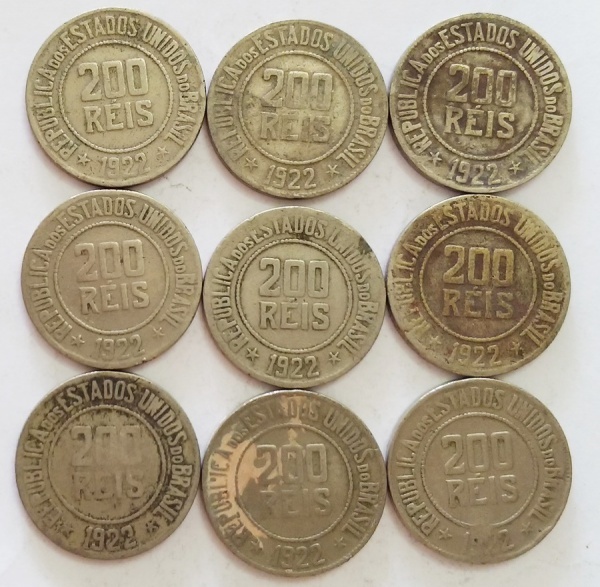 BRASIL - 9 MOEDAS DE 200 RÉIS CUNI ANO 1930 CIRCULADAS. 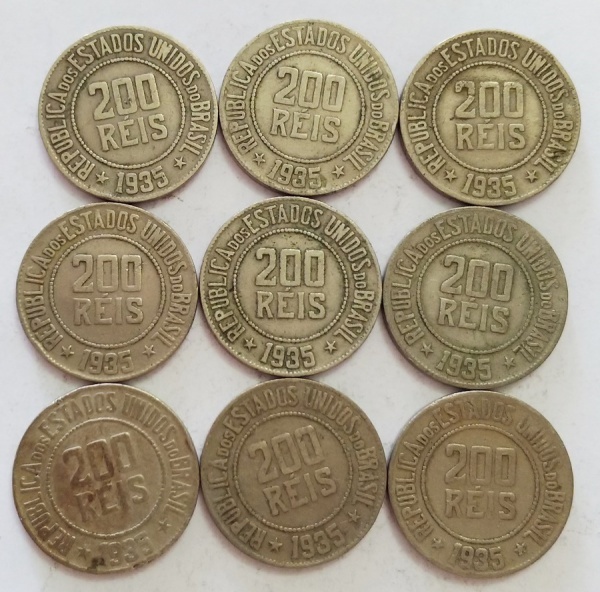 BRASIL - 9 MOEDAS DE 200 RÉIS CUNI ANO 1931 CIRCULADAS. 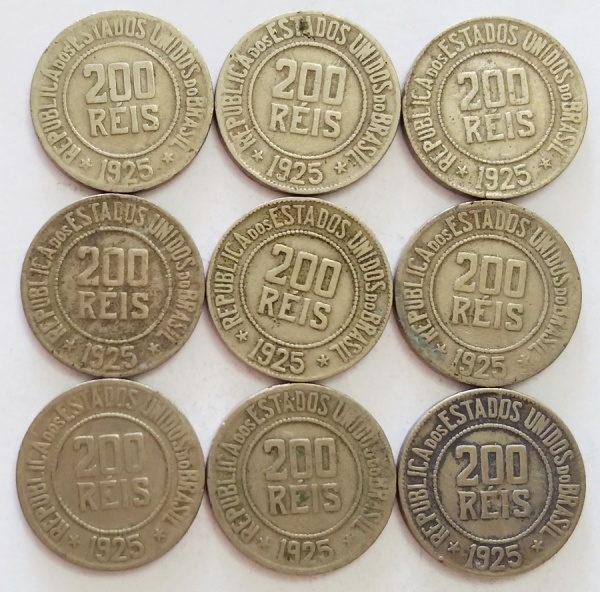 BRASIL - 9 MOEDAS DE 200 RÉIS CUNI ANO 1935 CIRCULADAS. 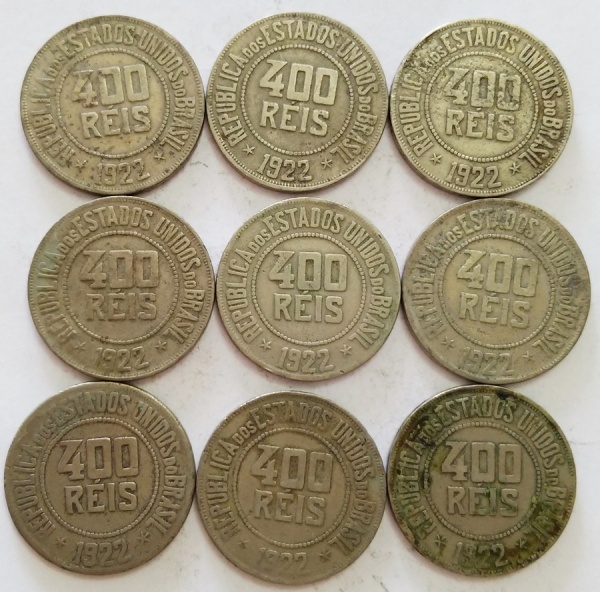 BRASIL - 9 MOEDAS DE 400 RÉIS CUNI ANO 1920 CIRCULADAS. 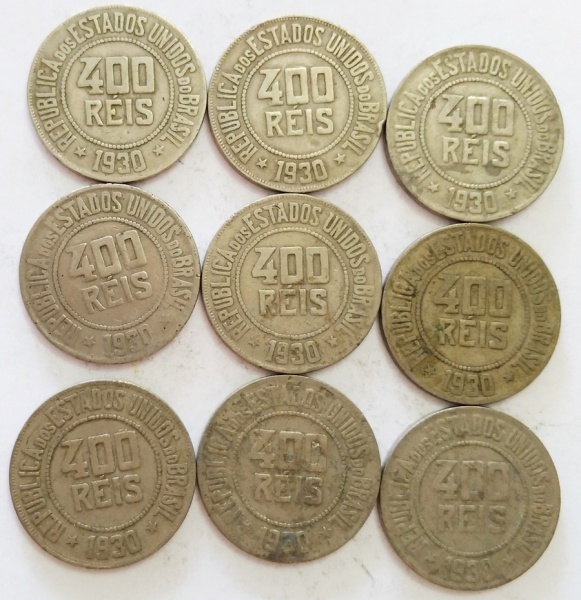 BRASIL - 9 MOEDAS DE 400 RÉIS CUNI ANO 1921 CIRCULADAS. 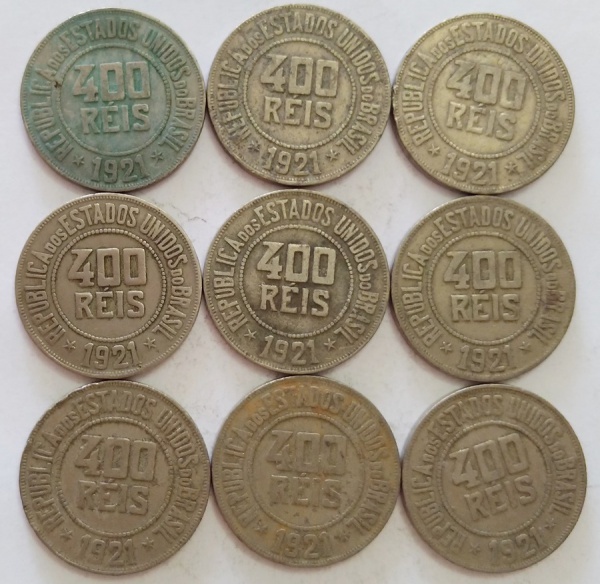 BRASIL - 9 MOEDAS DE 400 RÉIS CUNI ANO 1922 CIRCULADAS. 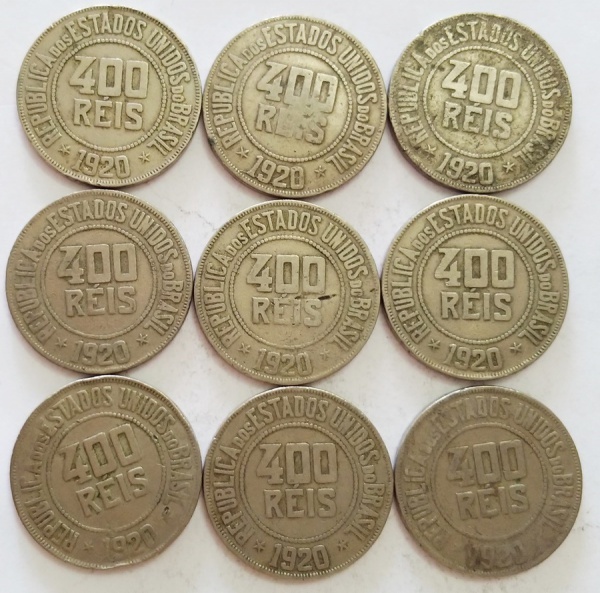 BRASIL - 9 MOEDAS DE 400 RÉIS CUNI ANO 1925 CIRCULADAS. 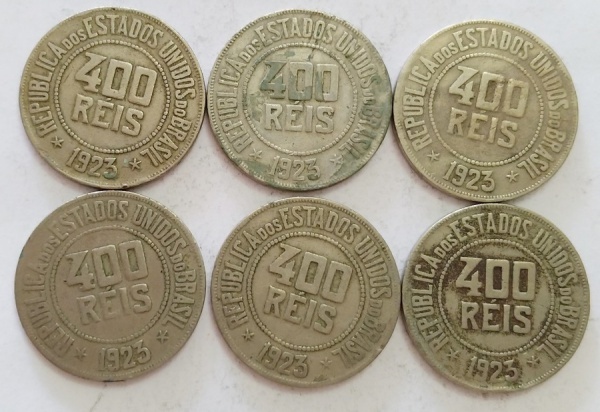 BRASIL - 6 MOEDAS DE 400 RÉIS CUNI ANO 1926 CIRCULADAS. 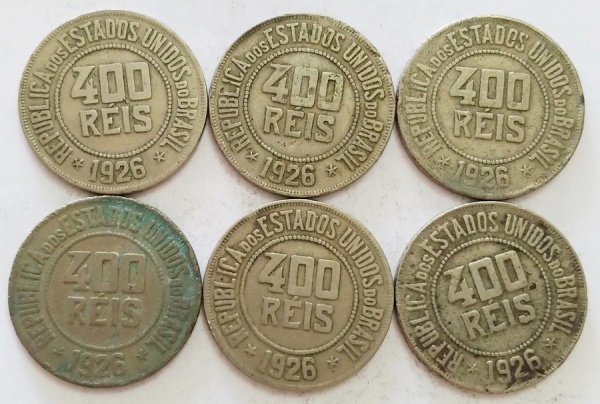 BRASIL - 6 MOEDAS DE 400 RÉIS CUNI ANO 1923 CIRCULADAS. 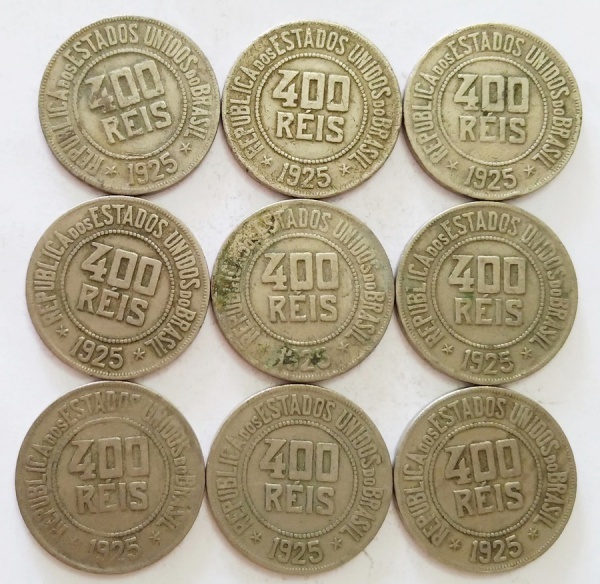 BRASIL - 9 MOEDAS DE 400 RÉIS CUNI ANO 1930 CIRCULADAS. 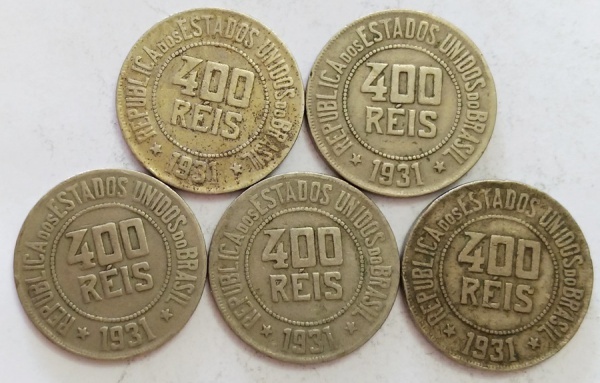 BRASIL - 5 MOEDAS DE 400 RÉIS CUNI ANO 1931 CIRCULADAS. ITÁLIA - 02 CÉDULAS MILITAR CIRCULADAS NA ÉPOCA DA GUERRA. BRASIL - 02 CÉDULAS 100 E 200 CRUZEIROS SÉRIE 0002ª NO ESTADO - ESCASSA. FRANÇA - 02 CÉDULAS MILITAR CIRCULADAS NA ÉPOCA DA GUERRA. BRASIL - 5.000 CRUZEIROS SÉRIE 7ª NO ESTADO S/FE - ESCASSA. BRASIL - 10 CRUZEIROS SÉRIE 351 - NO ESTADO. BRASIL - 1.000 CRUZEIROS SÉRIE 3209 DA 1ª ESTAMPA NO ESTADO MBC - DEFEITO NA IMPRESSÃO - BELA PEÇA DE COLEÇÃO. BRASIL - 2.000 RÉIS SÉRIE 29 CIRCULADA. BRASIL - 10.000 CRUZEIROS SÉRIE 6ª NO ESTADO S/FE - ESCASSA. BRASIL - 20 CRUZEIROS SÉRIE 242 - NO ESTADO. 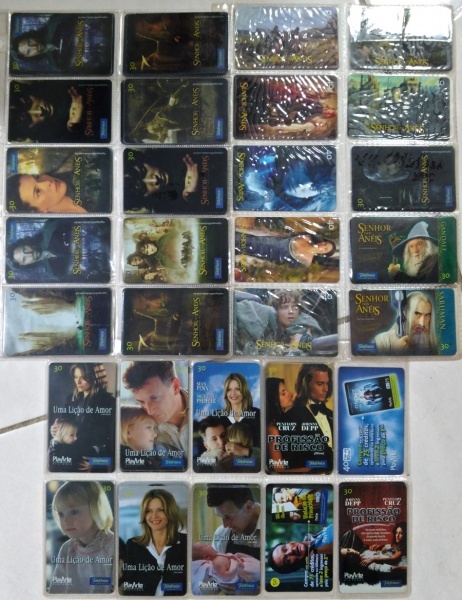 BRASIL - 10.000 CRUZEIROS CIRCULADO SÉRIE 127 - NO ESTADO. 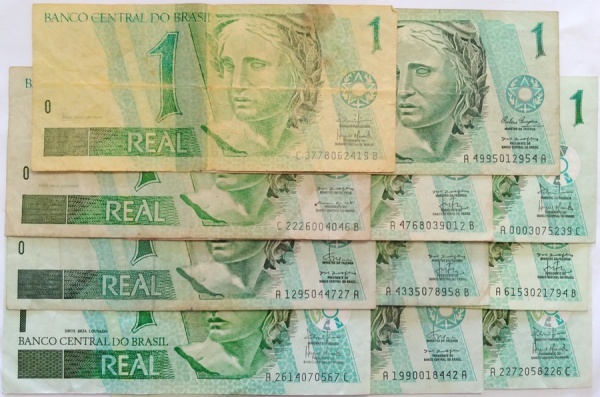 BRASIL - 1.000 CRUZEIROS SÉRIE 3328 NO ESTADO S/FE. BRASIL - 500 RÉIS ANO 1901 NO ESTADO MBC, APRESENTA DOIS FUROS DE TRAÇA. 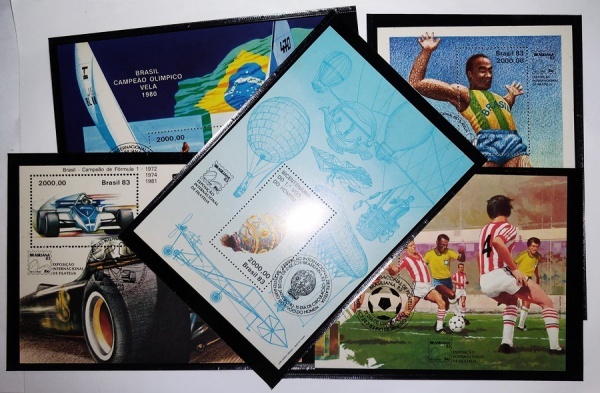 BRASIL - 1.000 CRUZEIROS AUTOGRAFADA SÉRIE 151 NO ESTADO MBC/S. 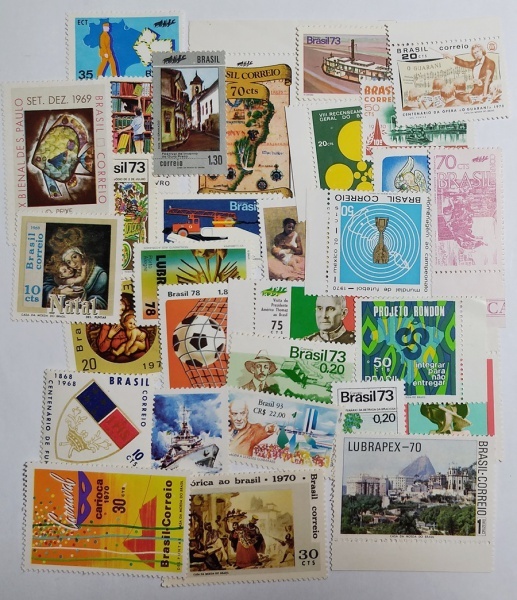 BRASIL - 30 SELOS MINT PARA SUA COLEÇÃO. 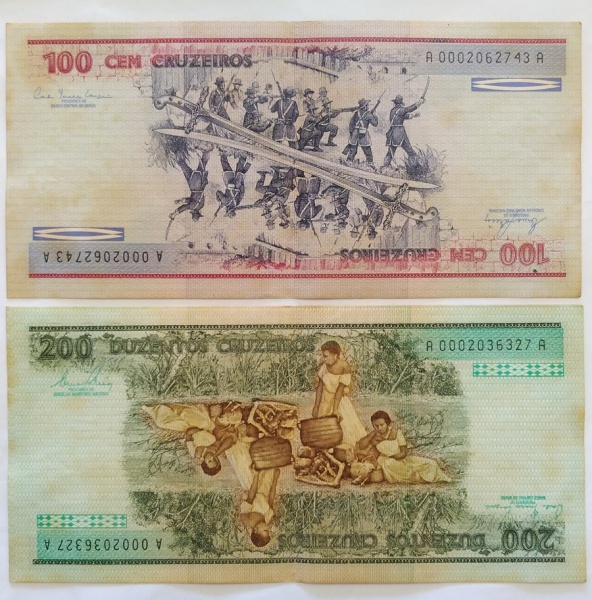 BRASIL - 5.000 CRUZEIROS SÉRIE 0001 NO ESTADO FE - ESCASSO. BRASIL - SÉRIE DOS BLOCOS DA BRASILIANA 1983 COM CARIMBO COMEMORATIVO - RAROS. BRASIL - 10 CÉDULAS DE 1 REAL CIRCULADAS DA 1ª FAMÍLIA COM BOAS ASSINATURAS. BRASIL - 10.000 CRUZADOS SÉRIE 0001 NO ESTADO FE - ESCASSO. BRASIL - 200.000 RÉIS ANO 1942 NO ESTADO MBC. 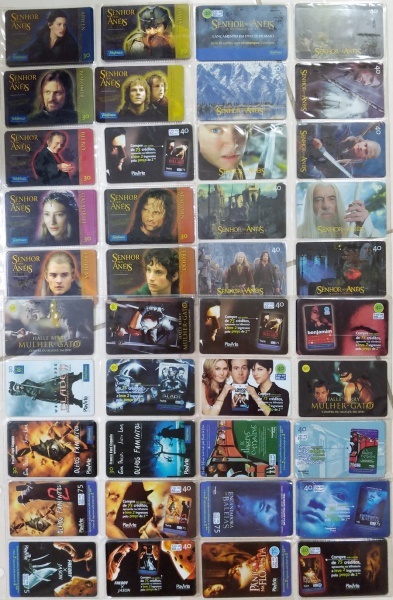 PARTE DE UMA COLEÇÃO DE CARTÕES TELEFÔNICOS "FILMES". 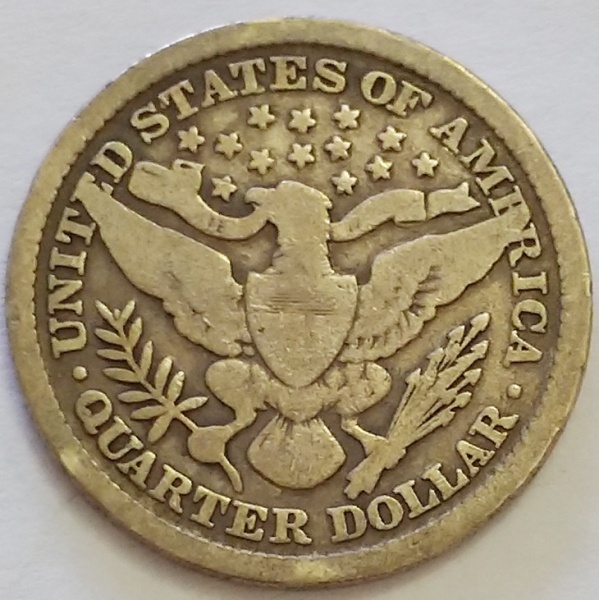 EUA - BELO QUARTER DOLLAR EM PRATA ANO 1896.